After the baffling false start of the Vandellas’ first record, Camel Walk, featuring Saundra Mallett on lead – and leaving aside the confusing decision by Motown to release two more previously-recorded Vandellas tracks featuring Gloria Jean Williamson on lead under the name “the Vells” the week after this single came out – this is the proper début release for one of the label’s biggest and best acts of the Sixties. Perhaps because the group didn’t have to wait long for their chart breakthrough – that would come with their second release, Come And Get These Memories, released some five months later, leading to an uninterrupted run of twenty (!) successive chart hits throughout the decade – and perhaps because of the tangled, confusing circumstances surrounding the group’s formation, this record (the only Vandellas record between 1962 and 1970 not to chart) tends to be overlooked by most historians. (I’ll Have To Let Him Go did become one of only a handful of Motown records picked up for release in Britain at the time, but this was only after Come And Get These Memories had been released in America to positive reaction, rather than as a mark of faith in this single on its own merits). The disdain extends as far as Martha Reeves herself, who describes the song as “rather forgettable” on her own website. This is all really rather unfair, as while the record doesn’t come close to the best of the Vandellas’ records during Motown’s Golden Age (a Golden Age they themselves would kick-start in 1963), it’s still a fine song, a midtempo R&B/pop crossover number featuring a great lead vocal. Originally written for Mary Wells, Martha Reeves, who had a completely different voice to Mary’s, does things with this material that the song’s writer Mickey Stevenson (who was also Martha’s boss in her day job as Motown A&R secretary) can’t possibly have envisaged. It doesn’t start all that promisingly, it has to be said. The song has been rearranged for a group performance; the Vandellas, without Martha, open the record almost acapella, with just a strummed guitar in the background for accompaniment: “I saw him kiss another / And watched him hold her tight / and I made up in my mind that very night”… the effect is strange, the guitar almost foreboding, the vocals shrill and slightly grating, much in the style of the label’s top female group of the time, the Marvelettes, but less endearing. It’s not looking good. But then, the lead vocal begins, and the song blooms suddenly into life, and it’s like going from black and white into Technicolor. Oh yeah, Martha Reeves is that good. As has been explained earlier, Martha wasn’t actually the lead singer of the Vandellas when this song was cut – that role fell to Gloria Jean Williamson, and Martha originally only got to sing this song because she’d earlier impressed Stevenson with an impromptu live studio performance, filling in for the absent Mary Wells during a Musicians’ Union inspection. 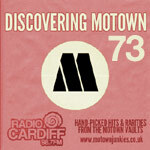 (Despite earlier reports, this recording is not of that performance – the proper Vandellas recording sessions for this, and other tracks, came quite a while later). As soon as this tape was in the can, however, the writing must have been on the wall; Martha, not Gloria, was the star of the show. It’s a fantastic lead performance; Martha begins by taking her cues from Mary Wells, aping her style for the first few lines (much as Hattie Littles had recently done on Here You Come), before finding her own groove, settling into her own style as the song progresses. The turning point comes with a big hook, Martha shifting up a gear for the middle eight at 1:24, delivering the lines “Move on, move on”, my heart cries / Find yourself another / Let him leave, oh oh-oh” with increasing verve and strength. She comes out of the middle eight swinging for the fences, and the Vandellas seem to draw from her confidence, their interplay with Martha’s impassioned lead forming some of the best female group harmonies yet heard on a Motown record. By the time we hit two minutes, Martha is already the Martha we know and love; her voice is simply massive, a hair’s breadth away from screaming her vocals yet never once in danger of letting that happen, showing remarkable control and technique, deftly dancing around the band and backing vocals, letting us know exactly how she feels… it’s spellbinding, and it’s irresistible. The song itself isn’t really up to the standard of Martha’s performance – but that’s probably because it wasn’t written with her in mind. (Ironically, the same thing would happen next time the Vandellas came to cut a single co-written by Mickey Stevenson, almost two years later – but that’s another story). However, the entire world had been put on notice that Motown had found another great group, almost out of nowhere; next stop, the charts. To this day, I don’t have a 45 of this song 😦 and I first heard it on “Collection of 16 Big Vol. 2” when I got copy of that finally about 1967. Yikes was my reaction -and sort of still is- to that shaky opening, but Martha’s lead vocal is already as authoritative on the subject of heartbreak as we’d find again on golden b-side like Old Love, Darling, I Hum Our Song, Love Makes Me Do Foolish Things and He Doesn’t Love Her Anymore. Since she grabbed me (at 9!) with Heat Wave and never me let go since, I didn’t have as much older material to go research on Martha as I eventually would with The Supremes and a few others. But I too found my fondness for this one. Your review is excellent as always. It’s amazing that such a poor seller was released in the UK, especially as “Come and Get These Memories” came out a mere month later. This turn of events meant that Martha was the only major Motown artist to have an unbroken run of all her singles released in the UK, a situation that I think lasted right up to the non-release of “Sweet Darlin’ ” in 1968. It wasn’t just how a record had sold in America that pushed Oriole’s buttons – there was (and indeed is to this day) a music industry maxim that success, or lack of it, in one country was no indication of how a record might fare on the other side of the Atlantic. Rather, it was an (often horribly misguided) attempt on Oriole’s part to judge how a record might sell to the British audience. (Hence the appearance of UK releases by the Valadiers and Mike & the Modifiers, but not, for instance, US chart hits from the Miracles and Marvelettes); in that context, and given the record’s quality, it’s not that baffling a decision. What is strange is that Oriole had a weekly quarter of an hour promotional programme on Radio Luxembourg, and that they were playing both of Martha’s singles on the same programme. Really? That’s awesome. I knew they had a mini-show, but didn’t know they played much of their leased Motown stuff, never mind two Vandellas records in the same show – but good for them! Although I would gladly listen daily to something called The Vandellas Hour, so I’m probably not a representative audience sample. I agree with the review but i think i might like the song more the next person. My mom always wondered what i saw in the song (she thought it was the Shirelles thanks to the opening). Today it remains one of my favorite “early Motown singles”. I liked this song as soon as I heard it, and bought the record new. It’s an average good Motown cut, and so, deserves the “7” rating. I actually got this and “Come And Get These Memories” before finding The Del-Phi’s’ ” I’ll Let You Know” on Check-Mate Records in a bargain bin. I found out later, that The Del-Phi’s (Dell-Fi’s) later became The Vells and Martha & The Vandellas. It’s also interesting to note that Martha and the Vandellas rerecorded this song for the Stereo issue of “Motown 16 Big Hits Vol. 2” which came out several years after the original release, which was issued in Mono only. The rerecording is much fuller, and with much more amplified backing vocals, similar in arrangement to their rerecording of “There He Is (At My Door)” which appeared on the LP “Dance Party.” I like the song, but especially liked the later rerecording. Interesting info, as I was wondering about the origin of this stereo version of “I’ll Have to let him go” as I was unaware of it until I bought the 2002 UK twofer CD of Come and get these memories / Heatwave albums. Until then I had only heard the mono version on 45 and on the mono Come and get these Memories LP. When I first heard this stereo version I was quite astounded as to how much better and ‘alive’ it sounded compared to the mono recording. Apparently, this stereo version was recorded 30th June 1964 and the mono version 1st August 1962. This is the exact opposite of ‘Jimmy Mack’ which sounds much fuller and more powerful on the mono 45 than the limp and grossly inferior stereo version on the Watchout LP.